When a card or effect is activated that includes any of these effects (Quick Effect): You can discard this card; negate the activation. ● Add a card from the GY to the hand, Deck, and/or Extra Deck. This card's name is a pun on Yashiki (屋敷), meaning mansion, and Zashiki-warashi (座敷童子), which means guestroom child". It's a spirit-like creature that is said to be a god/goddess appearing as a child that lives in storage rooms, and they would perform pranks, and those that managed to see one and not bothered by them, would be visited with good fortune. Discarding "Ghost Belle & Haunted Mansion" is a cost to activate its effect. It can be activated during the Damage Step. The effect of "Ghost Belle & Haunted Mansion" does not target. It is activated directly in a Chain to the activation of a Spell/Trap Card, the activation of the effect of a Spell/Trap Card, or the activation of a monster effect, that includes any of the "●" effects. Green Baboon, Defender of the Forest": When your opponent activates the effect of a "Green Baboon, Defender of the Forest" in the hand, the effect of "Ghost Belle & Haunted Mansion" cannot be activated in a Chain. When your opponent activates the effect of a "Green Baboon, Defender of the Forest" in the Graveyard, the effect of "Ghost Belle & Haunted Mansion" can be activated in a Chain. : When the opponent activates the effect of "Green Baboon, Defender of the Forest", can the effect of "Yashiki Warashi" be activated in a Chain? "Inferno Reckless Summon": When your opponent activates "Inferno Reckless Summon", the effect of "Ghost Belle & Haunted Mansion" can be activated in a Chain. : When the opponent activates "Inferno Reckless Summon", can the effect of "Yashiki Warashi" be activated in a Chain? "Miracle Fusion": When your opponent activates "Miracle Fusion", the effect of "Ghost Belle & Haunted Mansion" can be activated in a Chain. : When the opponent activates "Miracle Fusion", can the effect of "Yashiki Warashi" be activated in a Chain? 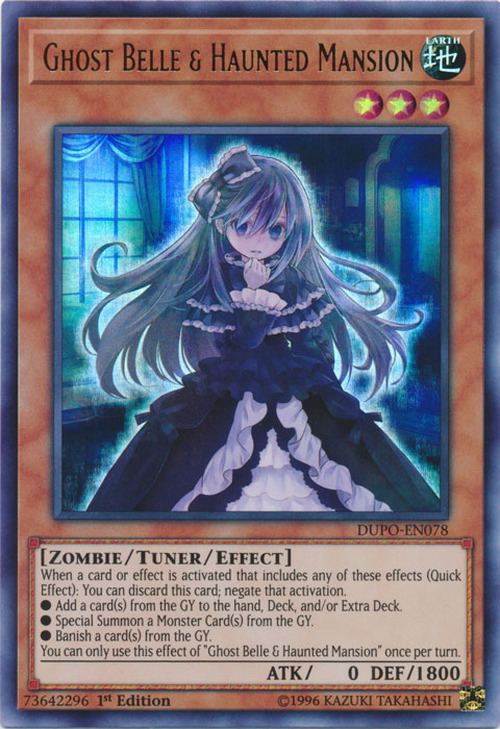 "Preparation of Rites": When your opponent activates "Preparation of Rites", the effect of "Ghost Belle & Haunted Mansion" can be activated in a Chain. : When the opponent activates "Preparation of Rites", can the effect of "Yashiki Warashi" be activated in a Chain? "Treasure Panda": The effect of "Treasure Panda" banishes a Spell/Trap Card(s) from the Graveyard as a cost to activate its effect, but when the effect resolves, it does not banish a card from the Graveyard, Special Summon a monster from the Graveyard, or add a card from the Graveyard to the hand or Deck. Therefore, the effect of "Ghost Belle & Haunted Mansion" cannot be activated in a Chain to the activation of the effect of "Treasure Panda". : When the opponent activates the effect of "Treasure Panda", can the effect of "Ghost Belle & Haunted Mansion" be activated in a Chain?